Welcome to our kit request page! Each kit contains pre-cut fabric pieces for the enclosed pattern, backing material and a QFK label. You supply the thread, batting and the love that goes into your quilt. If you need more than 2 kits, please contact info@quiltsforkids.org. If you are interested in a project for a school, scout or youth group, please click here for more information. Please note: As always, kits must be machine pieced, machine quilted and laundered. 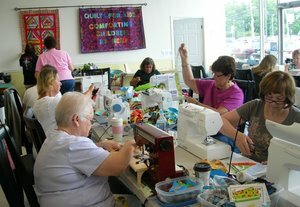 Please return your finished quilt in 4-6 weeks to Quilts for Kids, 494 Lincoln Highway, Fairless Hills, PA 19303; remember, a child is waiting for it. Any questions? Check this page. A word about Paypal...You don't have to have Paypal. That's just on our end. Just follow the check-out procedure all the way to the end, then look toward the bottom on the Paypal box and you will see your opportunity to pay with a credit card or debit card. Click here to view our kits!